Get fresh litter trays automatically delivered to your door. Choose when you’ll receive each shipment and how many trays you need. Free shipping and 10% discount included! Can I reuse the litter tray by throwing out the old litter and adding new litter? Litter trays are 22” x 14-1/2” x 2-1/2”. The usable litter bed area is 14” x 14”. 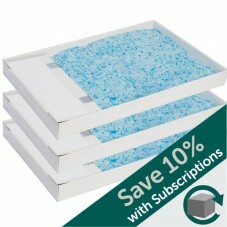 ScoopFree Free litter trays do not include lids and can be nested, allowing them to be stored in a smaller space. 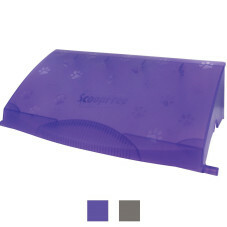 ScoopFree’s litter bed measures 14" x 14", and the exterior litter box dimensions are 27-3/8” x 19” x 7”. The height is 16-3/4” with the optional hood installed (the Ultra comes with the privacy hood). ScoopFree Slide’s litter bed measures 14" x 14", and the exterior litter box dimensions are 27” x 18-1/2” x 9”H. How do I change the litter tray? How can I make the trays last longer? 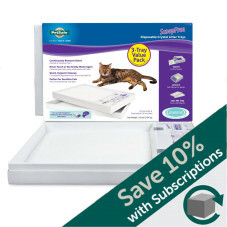 ScoopFree litter trays won't last forever, but each tray can give you up to 30 days of freshness without scooping. Here are a few tips to make each tray last even longer. Have at least 1 litter box per cat. Many experts recommend having 1 litter box for every cat plus an additional litter box. 3 cats can use the same ScoopFree litter box, but you'll have to replace the trays more often and you might see litter box bullying. Switch to the blue premium litter trays. The premium crystals reduce odor better than our dye-free regular crystals and 5x better than traditional clumping litter. You'll need to swap out trays less often because of odor with the blue trays. Keep fresh litter out of the waste trap. Don't put any litter underneath the waste trap lid when you pour the fresh litter into the tray. Mix the crystal litter once a week. This is extremely beneficial if your cat is sick, has high urine output, doesn't cover her waste, or always pees in the same spot. Be sure to mix the crystals from behind the rake and along the sides of the litter box. Don't mix the litter in the waste trap. Feed your cat premium food. Lower quality cat foods can contain filler such as crude fiber, ash, and byproducts that increase your cat's visits to the litter box. Remove extra waste in the trap. Out of room in the trap but the litter still seems good? Dump the waste in the trap and replace the tray. Fill the tray with half of the crystal litter at first. When the litter is no longer clean and fresh, dump the old litter and add the rest of the fresh litter. This will also help reduce tracking and spilling. Put the tray lid under the tray. The trays are designed to be leak-proof, but using the tray longer than recommended can lead to some urine leaking through the bottom. Put the lid under the tray to help reduce spills. Line the tray with a pee pad. Put a traditional doggie house training pee pad on the bottom of the tray before putting in the tray. This gives it an extra leak-proof layer to prevent spills. Setup is a snap. Simply lift the litter box and slide in the disposable litter tray filled with Premium Blue crystals litter for unbeatable odor control. We recommend replacing the litter tray every 20 - 30 days for one cat, every 10 - 15 days for 2 cats, or every 7 - 10 days for 3 cats. You may need to replace the litter tray more often if you have cats who eat a diet high in crude fiber, ash, and byproducts; cats over 10 years old; cats with health problems; and kittens under 6 months old. How will I know when to change the litter tray? The litter is saturated. As the crystals absorb urine, the litter will start to turn yellow. Once the majority of the litter turns yellow, the crystals are nearing their saturation point. When the crystals can no longer absorb any more moisture, you may start to notice an odor from the urine. The waste trap is full. When the waste trap is full, the purple waste trap lid won’t close completely. You may see small pieces of solid waste sticking out from underneath the lid. You may also start to notice an odor from the solid waste. What are the litter box's safety precautions? The rake will not sweep if a cat is in the litter box because it will be obstructing the infrared sensors. The countdown timer will reset itself, so the rake will begin to sweep 20 minutes (or 5, 15, or 20 if you have ScoopFree Ultra) after your cat leaves the litter box again. What is the difference between ScoopFree Original, Ultra, and Slide? ScoopFree® Original and Ultra are automatic; they automatically sweep waste after your cat uses the litter box. ScoopFree® Slide is manual; Slide’s handle must be manually engaged once a day to remove waste. Health counter tracks the frequency of your cats’ litter box usage to help monitor their health. What is the difference between the Premium Blue litter tray and the Free litter tray? The Premium Blue litter tray comes preloaded with Premium Blue Crystal Litter that stops odor 5 times better than clay and clumping litter. All Premium Blue litter trays come with a lid. When the tray is ready to be disposed, simply cover it and toss it in the trash. 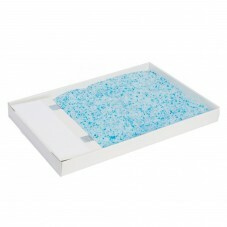 The Free Crystals Litter Tray is made from recycled materials (paper with no bleach added) and comes pre-filled with premium crystal litter free of perfumes and dyes. 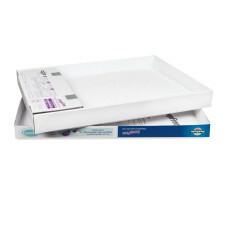 Free trays do not come with a lid so the trays nest, making them easier to stack and store in small spaces. Where do I find the serial number to register my ScoopFree? The serial number is located on a sticker on the bottom of the litter box (not the litter tray) on the same end as the indicator light. The serial number is listed after the letters “SN” at the bottom of the sticker. Click here to register your product. Where do I get replacement litter trays? You can purchase litter trays online or subscribe for our auto-ship service and get litter trays automatically delivered to your home. 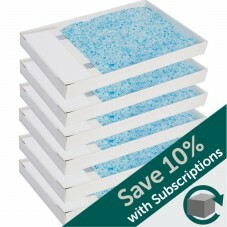 You'll also receive a 10% discount and free shipping with our subscription program. You can also find litter trays at certain pet specialty stores. Call a PetSafe authorized retailer near you to ask about local availability. Which products do the litter trays fit? 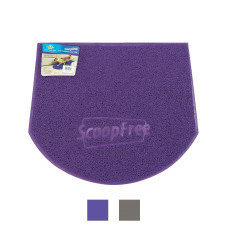 All ScoopFree litter trays work with all ScoopFree litter boxes, including ScoopFree Slide. They do not work with the Simply Clean or Sweep One litter boxes. Why do the trays not last as long for older cats? Cats over the age of 10 years old tend to be prone to kidney issues which account for increased urine output and decreased litter tray lifespan. Rapid flashing indicates the sensors are blocked, which occurs when the cat is inside the litter box. If the indicator light is flashing rapidly and your cat isn’t inside the litter box, it’s possible urine or other debris is blocking the sensors. To clean the sensors, dip a cotton swab in isopropyl rubbing alcohol and gently swipe inside the sensor holes on both sides of the litter box. 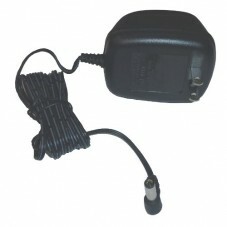 After cleaning, unplug the litter box then plug it back in. The indicator light should return to a steady green. Slow flashing indicates the litter box is in countdown mode, which occurs after your cat uses the litter box. The rake will sweep 20 minutes after your cat uses the litter box (or 5, 15, or 20 minutes after your cat uses the litter box if you have ScoopFree Ultra). The indicator light will return to a steady green once the rake is back in its home position. Will I ever have to scoop waste? ScoopFree is designed to be left alone for up to 20-30 days with one cat. Most users never have to remove the waste because it is automatically raked into the covered waste trap built into the disposable litter tray. Will I have to add more litter crystals to the tray? Never add litter to your ScoopFree litter box or use another type of litter. The Premium Blue Crystal litter is formulated especially for ScoopFree. The amount is carefully pre-measured for optimal performance. Too little or too much litter may cause your ScoopFree to malfunction. You can add two handfuls of your old litter to the Premium Blue crystals in your ScoopFree litter box to help your cat adapt when you first use the box without risking malfunction. Will my cat like ScoopFree? 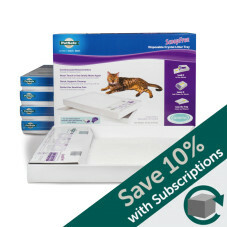 Leave your cat's old litter box next to the ScoopFree box. Add a few handfuls of your cat’s old litter to the ScoopFree litter tray and add a few handfuls of the ScoopFree crystal litter in your cat's old litter box. Stop cleaning the old litter box. As the old litter becomes more shallow and dirty, your cat should start using the cleaner ScoopFree box. If your cat is startled by the raking noise, turn off the ScoopFree box and scoop waste manually for a few days until your cat is used to the new box. If you have a kitten under 6 months old, we recommend leaving the box unplugged and scooping waste manually. You can start getting her used to using the litter box with these tips. Kittens have a natural reflex to use the bathroom after eating, playing, or napping. Put your kitten in the litter box after these activities to help her associate the litter tray with the instinct. Place the litter box away from the food and water bowl. Cats prefer not to use the bathroom near where they eat and drink. Put the litter box in a quiet, visible place where she can get to it quickly. Getting all the way across the house to find the litter box could result in accidents. The location should also be safe and quiet so your kitten won't be startled or distracted. Keep the box clean. Scoop waste often and change the litter tray every few weeks. Cats and kittens prefer a clean box. Stir the litter crystals once a week to distribute saturated crystals. Kittens pee more often than adult cats, so the litter box will get dirty more quickly. Will my cat track litter out of the box? You will experience minimal tracking with the ScoopFree litter box due to our unique litter formulation. However, we do offer a hood for the Original system (this is included with ScoopFree Ultra) and an anti-tracking carpet for all 3 litter boxes. The hood does not fit ScoopFree Slide due to the manual raking mechanism. 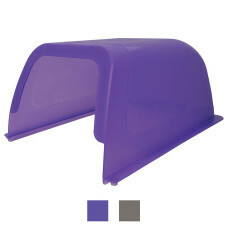 Purchase these accessories for the ScoopFree litter box to ensure litter stays where it should. ScoopFree has a large 14” x 14” litter bed that can accommodate up to two large cats. Most large cats can also easily use ScoopFree with the hood. How old should my cat be before using a ScoopFree litter box? We recommend ScoopFree litter boxes for cats over 6 months old. If you have a kitten under 6 months old, contact Customer Care to ask about litter options for kittens. You can manage your account online at My Account. Log in with your email and password. Or contact Customer Care to manage your subscription by email or by phone at 1-866-738-4379. Customer Care is available Monday through Friday 8 am - 8pm and Saturday 9 am - 5pm EST. When my subscription moved to PetSafe, did the rates change? 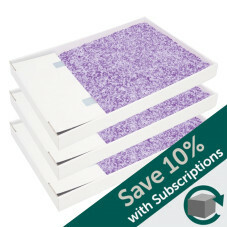 You will receive a 5% discount off your current subscription rate. That’s just our way of welcoming you to the PetSafe family. Shipping will still be included at no charge, except for residents of Alaska and Hawaii. Tennessee residents will now be charged sales tax. Why do I see “Radio Systems Corporation” on my subscription bill? On your subscription billing statement, you will see charges from Radio Systems Corporation instead of PetSafe. Radio Systems Corporation is the parent company of the PetSafe brand and many other pet brands including Invisible Fence®, Premier®, Drinkwell®, and Innotek®. Learn more about PetSafe and Radio Systems Corporation. My cat stopped using the litter box. Animals learn by association , so you’ll need to adapt what your cat is peeing on now to the litter box in small, slow steps. If at any time your pet goes backwards a few steps, this is an indication you're pushing him/her too far too fast. Slow it down or even back up a stage or two, then try again, but at a slightly slower pace. Your pet only wants to make you happy, so continual praise and reward is the key! Move the litter box or Pet Loo near the spot. Leave it like this for a few days. Move the litter box or Pet Loo on top of the spot. Leave it like this for a few days.